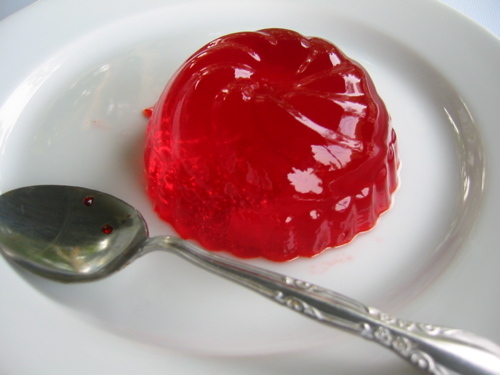 Can Jello Help You Maintain Weight Loss? Previous research has shown that gelatin can suppress short-term appetite more than other sources of protein; one study showed a breakfast that contained gelatin as a protein source reduced food intake at lunch by 20% compared to other proteins. However, the problem with these studies is that they used gelatin by itself. Gelatin is an incomplete protein, meaning it does not contain all of the amino acids that are essential to your body. Thus, you could never use gelatin as your sole protein source in a long-term diet. The other problem with using gelatin by itself is that it may not have the same effects when combined with other proteins. This would mean that the studies that show an appetite-suppressing effect would not be relevant to real life situations. To get an idea of how gelatin might affect weight maintenance in real life situations, a group of researchers from the Netherlands looked at the effects of gelatin on weight maintenance after a weight loss diet. They took 65 overweight people who lost 6% of their body weight over a period of 8 weeks. The researchers divided the people into 3 diet groups. One group got 15% of their calories from milk protein. Another group got 30% of their calories from milk protein. The third group got 15% of their calories from milk protein and 15% of their calories from gelatin. This was for 8 weeks, and all of the food was provided to the subjects. For another 8 weeks, the researchers provided 50% of the subjects' food intake. Of that food intake, the first group got 30% of calories from milk protein, the second group got 60% of the calories from milk protein, and the third group got 30% from milk protein and 30% from gelatin. The other 50% of the subjects' food intake came from fruits and vegetables. The researchers assured compliance by measuring nitrogen in the subjects' urine (protein is the only source of nitrogen in your diet; the more protien you eat, the more nitrogen you excrete in your urine). The researchers looked at many variables, but I'm only going to talk about the main ones of interest: body weight, fat, hunger, and hormones that regulate appetite. Overall, there were no significant differences between the groups in regards to body weight, body fat, hunger, or appetite-regulatory hormones during the weight maintenance period. All 3 diets were equally effective at promoting weight maintenace; all the groups maintained their weight loss over the 16 weeks. In fact, there were no differences between groups in any of the variables measured in this study. The results show that, when you combine gelatin with other sources of protein, it doesn't offer you any satiety benefit over consuming complete proteins like milk protein. Therefore, incorporating gelatin into your diet probably won't help you eat less. This also confirms that the appetite-suppressant effects of gelatin seen in other studies don't apply to real life. One surprising result of this study was that there were no differences in weight maintenance between the high protein intakes (30% of calories) and normal protein intake (15% of calories, right around the Recommended Dietary Allowance). Other studies have shown high protein intakes to result in better long-term weight maintenance. There are probably a couple reasons for this. First, the responses to the diets were highly variable and all over the place; whenever you have a lot of variability, it's hard to see significant differences between groups. There was a very slight trend for the high milk protein group to maintain their fat-free mass better than the normal protein group, supporting the idea that the variability masked any group differences. Second, the researchers had pretty tight control over food intake over the first 8 weeks. Since the calorie intake was controlled, it is not suprising that the weight maintenance was similar. Results may have been different if the food intake was ad libitum, meaning the subjects ate as much as they wanted. In those instances (which I would argue are more relevant to real life), high protein intakes have been found to be superior. Another benefit of gelatin is that it helps your nails and hair …mine are stronger after eating gelatin daily for over a month. Anything that prevents eating cake, cookies, and refined carbs,like pasta is a plus to me!